Why customize APIs if you don't have to? Application programming interfaces often demand nearly as much attention as the applications themselves, according to some software industry officials. Agencies that have paid systems integrators to develop custom and often poorly documented application interfaces are finding themselves stuck with high lifecycle costs, said Harry Wong, president and chief executive officer of Casahl Technology Inc. of San Ramon, Calif.
'Customization is a polite word for hacking. They hack their way through, charging a lot of money,' Wong said. At every major upgrade, the application interfaces change, creating more manual work for the integrators, he said. Wong believes a better alternative is the new generation of enterprise application integration tools from data integration vendors such as his company and Convoy Corp. of Emeryville, Calif.
Convoy/DM 3.0 and Casahl's Replic-Action 6.0 avoid custom coding. Instead, a database or application administrator manages the automated interface relationships between source and target data through point-and-click graphical wizards. With the Replic-Action wizard, an application administrator can synchronize data between most workgroup apps and enterprise apps, Wong said. 'We've built on top of Microsoft Transaction Server and our own clustering technology,' he said. Replic-Action 6.0 extends the real-time synchronization of Casahl's Replic-Action for Notes to Microsoft Corp. workgroup products such as Internet Information Server, Exchange Server, Office, and database managers Access and FoxPro. 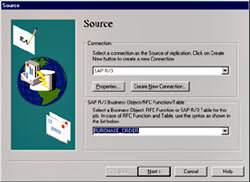 The Replic-Action software provides connectors for workgroup apps to enterprise and database applications from SAP America Inc. of Wayne, Pa., J.D. Edwards & Co. of Denver, PeopleSoft Inc. of Pleasanton, Calif., Oracle Corp., Sybase Inc., Microsoft, Informix Corp. and IBM Corp.
Replic-Action 6.0 handles the event logging, point-and-click integration, real-time transaction processing, data synchronization, transformation, workflow triggering, job sequencing and load balancing. 'The minute you put more than one Replic-Action server there, you automatically load-balance,' Wong said. Replic-Action runs under Microsoft Windows NT Server 4.0 on Intel hardware. 'We recommend a machine with sizable memory,' preferably 128M or more, Wong said. Replic-Action moves data changes from Microsoft SQL Server, for example, into SAP R/3 and from SAP R/3 into SQL Server. 'At no time do you need to install R3 on your laptop' if you are sometimes a disconnected user, Wong said, even though SAP might still charge for concurrent-use client licenses. 'You can make changes to the database on the road and update the changes via modem,' Wong said. By using the company's Component Object Model integration tool, Wong said, users can stick with their familiar desktop PC or workgroup applications and avoid the expense of learning a new enterprise client application. Like Casahl, Convoy automates metadata repository and system management functions with its enterprise application integration software, Convoy/DM 3.0. It manages periodic replication between enterprise applications and older Cobol file structures, Convoy vice president Bob Bessin said. 'Very often older systems can't be changed'they're too specialized,' he said. As its metadata repository and target databases, Convoy/DM supports Oracle, Microsoft SQL Server, Sybase Adaptive Server, Informix Dynamic Server and IBM DB2 running on IBM S/390, AS/400 and RS/6000 server hardware. Convoy's tool extracts data and metadata from all PeopleSoft modules, Cobol-based file structures including VSAM, QSAM, IMS and IDMS, Open Database Connectivity databases and delimited flat files. Convoy/DM's auto-mapping permits user-defined transformations and validations. In addition to predefined reports, it builds user-defined and custom-formatted reports from the metadata repository. Bessin said the Environmental Protection Agency has used Convoy/DM to convert and move human resources data into an Oracle relational database management system on a Compaq AlphaServer running PeopleSoft HRMS. Convoy/DM 3.0 costs $80,000 to $100,000 for up to 10 developer licenses, three server licenses and a full set of metadata extractors for PeopleSoft Financials, for example. Casahl licenses its Replic-Action 6.0 server for $3,000 per CPU. Application-specific connectors are priced separately; the IBM Lotus Notes connector is $3,000, the Microsoft Exchange connector $2,000, the SAP R/3 connector $15,000 and the Oracle connector $5,000. Contact Casahl Technology at 925-328-2828 and Convoy at 510-601-4950.